It isn’t often I get the chance to read an ‘adult’ book – and it is very rare for me to read a biography. I am half way through this volume (I’m reading a proof I found behind the till a little while ago), and am beginning to think that I really should watch the books that are published for that genre, so I don’t miss out, as I nearly did with this.one. Twelve hours later my bedroom was a different place. It had a Kestrel in it. Perched on my jiggery paw. It was gawky, half-dressed, its jumper ruffed up over its baggy trousers and sockless feet, an in-betweener with a tetchy temper, tufted with sneezy down. I could smell it. Sweet, musty, dry and when it shook, a cloud of glittering dust puffed into the shaft of evening sun that cut through a crack in the pegged-together curtains. I could smell its droppings too, or mutes as falconers call them; wet and papery, they had slapped Marc hard across his starred cheek, blotted his sparkling corkscrew hair and blistered his guitar…. His chest lightened as he banked up hard, the air riffling his feathers, tickling his legs, he squeezed his toes together and heard his wing tips whizzing as he belted into a big curve out of the shade into the dazzling sun, slipping across the sky so fast it made his nose run. And then into an instant white-out, a shocking cold on his eyes, tearing tiny tears from the mist, racing in little rivulets over his back and down his tail and through the fluxing honey glow of the facing sun all strewn over with a tracery of fine thread, then the world flashing far beneath him as he hurled out into a vast canyon of puffy grey vapour. This volume has taken me back to the sounds and smells of my youth. The sounds of a milk float, bottles gently clinking…television shows I had forgotten and more recently describes the all encompassing over load of my senses as I have handled birds of prey over the years, the sights, touch, sounds, smells and almost taste of birds. Its an extraordinary piece of writing. Why Ebury Press didn’t use a close up of a kestrel for the cover of this book, (or the photograph above) I really don’t know – the hardback is available now with the cover I have shown at the beginning of this post. This really is an extraordinary. It is so much more than ‘A Memoir’. Robyn Silver’s life is dull, torpid, and repetitive to say the least, however, having wished for a little excitement in her life she is astonished to find herself seeing things. Not very nice things either. Her large family are oblivious. When her school is then demolished by trees uprooted which destroyed the roof, she and her fellow pupils find themselves being educated in a local large house, owned by a reclusive man who seems more than usually unwilling to have the school on his property. Things combine to make her life a lot less dull – things liven up very quickly. One piece of advice I will give following reading Robyn Silver The Midnight Chimes. This book is darker than you might expect from the cover, which had me thinking of a Jill Murphy type tale written for older readers. Nothing like this happened to the Worst Witch though – this is a very different animal all together and is brilliant. If you don’t read anything else this summer it won’t really matter – I can’t think that there will be much that will give as much pure joy and pleasure as this small volume. I started to read this whilst reading three other titles (as is often the way of things); it quickly became, however, the only book I read for two days. This is gorgeous, and is one of the most charming and funny books you will ever read. Guylain Vignolles works at a book pulping factory. A job he abhors, but carries it out with care and respect for the volumes that pass through his hands. Each evening he steals away the odd leaf that didn’t quite make through the workings and had came to rest on the inside of the machine. In the morning, after drying the sheets, he reads from them. An eclectic set of texts, to a train carriage of people who listen avidly. This is a story of friendship, and of two quests. One for a pair of limbs and the other for something much more important. Beautifully written and translated (it is a French volume) with a lovely use of language and character – it is a book of hope. It is extremely rare for me to find an Adult’s book that I have enjoyed so much. Many adults I come across say they have no time to read. They have too many books to read already. Make the time, and further, put the others aside. This is not a big book, but it is a marvellous one. Published by Point Blank Books (an imprint of Oneworld Publications). I like my crime to be what I refer to as ‘friendly’. More often than not the crime detailed in the story (always fiction, it can’t be ‘friendly’ crime if it is not), is murder. I am not one on the whole, for whom the deceased has been tortured before their death, for any reason. I enjoy Elizabeth George, the odd Agatha Christie, Stephen Booth, and have loved Janet Evanovitch’s Stephanie Plum volumes. Though those do have a strong line of violence. They are an exception, I find the humour of the books tempers the rather grim elements. I first found out about Steve Burrows’ new series of books when I came across the title A Cast of Falcons, and investigated. I have had a love of raptors for many years (taking the opportunity to fly and hunt with them when I can) – and looked into this volume as a result. It isn’t published yet. A Siege of Bitterns, however, was – so I bought it – just on the off-chance and it has been a brilliant read. This mixes the world of bird watching with classic murder, with subtle and wonderful twists. DI Domenic Jejeune has recently been transferred from London to Norfolk under the mixed blessing of being some sort of police star – however, whatever the success he has had in his past with his investigations or might have in the future hasn’t given him the joy that he has had from his knowledge and joy of watching birds. The book is set in Norfolk and its descriptions of the landscapes has made me think I need to visit the marsh lands and the area, as soon as possible. It is a heartfelt book – Steve Burrows joy of natural history is all pervading in this start of a wonderful series. A Pitying of Doves is listed as coming soon on Oneworld Publications web site and I hope that A Cast of Falcons will follow soon after. If Steve Burrows had been resident in the UK, I would have contacted him, in the hope of arranging an event at my store. He lives in Canada (from where DI Jejeune originates) – which is a bit far I suppose. Never mind, I will I am sure enjoy the next book in the series, and am looking forward to its arrival. I have recently been sent a copy of this book, which was first published in 2006 – a decade ago. It won the Blue Peter Award back in 2010 too. I remember it being published and also not picking it up to read it for some reason I can’t remember. Embarrassingly it was probably because of the cover, which didn’t entice me. Ten years ago I hadn’t worked out that covers, which can be such a positive addition to a volume can also be misleading. I really regret not reading this before – it’s wonderful. This is the story of Dax Jones who at the start of the story is living with an overbearing and rather unpleasant step-mother whilst his father works on the oil rigs. School is as much about avoiding the bullies as a place to learn. When he is cornered, frightened and angry, he feels himself changing and things are different for him from then on. 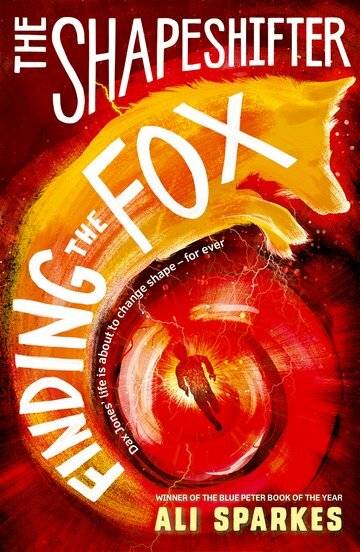 As the title indicates Dax is a shapeshifter and finds himself running on four legs, his eyes spotting things in great detail and his nose full of the environment through which he is moving. The story develops quickly, is full of adventure and is superb – I am really enjoying it. This is another I have decided to review before it is finished. I keep picking it up when I should be doing something else. Any excuse will do. Oxford University Press sent me this copy as they are going to republish the series with a new cover. The reprint of this volume (the first of five in the series) comes out on the 5th of May – in three days. The picture of the cover, at the start of this post is that of this new edition. The smaller shows the old edition of the books: Finding the Fox, Running the Risk, Going to Ground, Dowsing the Dead, and Stirring the Storm.